Werkshcau Director Bertram Schultze addresses the audience at the opening on Sat 14 Oct 2013. View of the Werkschau/Halle 15 space. Visitors watch a documentary about Robert Lenkiewicz. 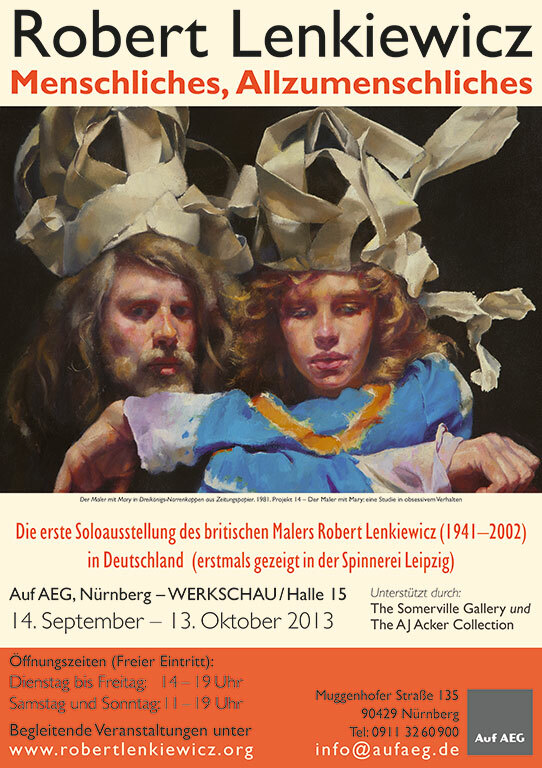 The first exhibition in Germany of paintings by British artist Robert Lenkiewicz (1941-2002), organised by The Lenkiewicz Foundation, will move to Nuremberg’s Auf AEG on 14 September (until 13 October) from its acclaimed showing at The Spinnerei, Leipzig in June and July. The ten-year anniversary of the artist’s death was marked last year in the South West of England with a large-scale exhibition entitled Human, All Too Human and this show, in greatly expanded form, is travelling under its German title – Menschliches, Allzumenschliches. Kritik der Kritik – Francis Mallet erwidert eine Kritik von Dr. Harald Tesan. Curator Francis Mallett's reply to Dr Harald Tesan - text in English. (Or as PDF here). 70 x 53 cm. Watercolour and bodycolour on paper. 70 x 53 cm. Aquarell und Deckfarbe auf Papier. 174 x 100 cm. Oil on canvas. 174 x 100 cm. Öl auf Leinwand. 219 x 287 cm. Oil on canvas. 219 x 287 cm. Öl auf Leinwand. 188 x 203 cm. Öl auf Leinwand. 101 x 76 cm. Oil on canvas. 101 x 76 cm. Öl auf Leinwand. Selbstbildnis im Pierrot-Kostüm mit Diogenes. 1970. 84 x 77 cm. Emulsion auf grundiertem Putz. 152 x 152 cm. Oil on canvas. 152 x 152 cm. Öl auf Leinwand. 122 x 92 cm. Oil on canvas. 122 x 92 cm. Öl auf Leinwand. 97 x 146 cm. Öl auf Segeltuch. Restauriertes Fragment. 61 x 190 cm. Oil on canvas (diptych). 61 x 190 cm. Öl auf Leinwand (Diptychon). 196 x 214 cm. Oil on canvas. 196 x 214 cm. Öl auf Leinwand. 198 x 343 cm. Oil on canvas. 198 x 343 cm. Öl auf Leinwand. 211 x 274 cm. Oil on canvas. 97 x 147 cm. Oil on canvas. 97 x 147 cm. Öl auf Leinwand. 190 x 131 cm. Oil on canvas. 190 x 131 cm. Öl auf Leinwand. 190 x 95 cm. Oil on canvas. 190 x 95 cm. Öl auf Leinwand. 61 x 122 cm. Cryla on board. 61 x 122 cm. Cryla [Acrylfarbe] auf Karton. 122 cm diameter. Oil on wood. 122 cm Durchmesser. Öl auf Holz. 56 x 64 cm. Öl auf Karton. Aesthetic Note. 42 x 30 cm. Watercolour, pen and ink and bodycolour. Ästhetische Notiz. 42 x 30 cm. Aquarell, Tuschfeder und Deckfarbe. 59 x 85 cm. Oil on panel. 59 x 85 cm. Öl auf Holz. 36 x 45 cm. Oil on board. 36 x 45 cm. Öl auf Karton. 142 x 162 cm. Oil on canvas. 142 x 162 cm. Öl auf Leinwand. 152 x 145 cm. Oil on canvas. 152 x 145 cm. Öl auf Leinwand. 121 x 160 cm. Oil on canvas. 121 x 160 cm. Öl auf Leinwand. 218 x 473 cm. Oil on canvas. 218 x 473 cm. Öl auf Leinwand. 169 x 215 cm. Oil on canvas. 169 x 215 cm. Öl auf Leinwand. 169 x 234 cm. Oil on canvas. 169 x 234 cm. Öl auf Leinwand. 36 x 30 cm. Oil on board. 36 x 30 cm. Öl auf Karton. 55 x 57 cm. Oil on board. 55 x 57 cm. Öl auf Karton. 40 x 28 cm. Oil on paper. 40 x 28 cm. Öl auf Papier. 41 x 56 cm. Oil on board. 41 x 56 cm. Öl auf Karton. 121 x 76 cm. Oil on canvas. 121 x 76 cm. Öl auf Leinwand. 45 x 51 cm. Oil on canvas. 45 x 51 cm. Öl auf Leinwand. 76 x 61 cm. Oil on canvas. 76 x 61 cm. Öl auf Leinwand. 40 x 28 cm. Cryla [Acrylfarbe] auf Karton. 75 x 62 cm. Oil on canvas. 75 x 62 cm. Öl auf Leinwand. 120 x 162 cm. Oil on canvas. 120 x 162 cm. Öl auf Leinwand. 48 x 69 cm. Oil on canvas. 48 x 69 cm. Öl auf Leinwand. 51 x 43 cm. Oil on sailcloth. 51 x 43 cm. Öl auf Segeltuch. 145 x 99 cm. Emulsion on canvas. 145 x 99 cm. Emulsion auf Leinwand. 24 x 29 cm. Cryla on wood panel. 24 x 29 cm. Cryla [Acrylfarbe] auf Holz. 84 x 66 cm. Cryla [Acrylfarbe] auf Papier, auf Karton gelegt. 76 x 58 cm. Oil on board. 76 x 58 cm. Öl auf Karton. 42 x 55 cm. Cryla on paper. 42 x 55 cm. Cryla [Acrylfarbe] auf Papier. 41 x 55.5 cm. Cryla on paper. 41 x 55,5 cm. Cryla [Acrylfarbe] auf Papier. 42 x 57 cm. Cryla on paper. 42 x 57 cm. Cryla [Acrylfarbe] auf Papier. 152 x 87 cm. Oil on canvas. 152 x 87 cm. Öl auf Leinwand. 183 x 152 cm. Emulsion on canvas. 183 x 152 cm. Emulsion auf Leinwand. 135 x 135 cm. Oil on canvas. 135 x 135 cm. Öl auf Leinwand. 102 x 102 cm. Oil on canvas. 102 x 102 cm. Öl auf Leinwand. 152 x 122 cm. Oil on canvas. 152 x 122 cm. Öl auf Leinwand. 128 x 117 cm. Oil on canvas. 128 x 117 cm. Öl auf Leinwand. 180 x 122 cm. Öl auf Leinwand. 141 x 87 cm. Oil on canvas. 141 x 87 cm. Öl auf Leinwand. 186 x 128 cm. Oil on canvas. 186 x 128 cm. Öl auf Leinwand. The Painter, Early Morning. No Saturated Colour, No Saturated Pain. 1995. 37 x 29 cm. Watercolour on paper. Der Maler, frühmorgens. Keine gesättigten Farben, kein gesättigter Schmerz. 1995. 37 x 29 cm. Aquarell auf Papier. 39 x 28.5 cm. Pen, ink and watercolour. 39 x 28,5 cm. Tuschfeder und Aquarell. 56 x 56 cm. Oil on canvas. 56 x 56 cm. Öl auf Leinwand. 33 x 25.4 cm. Drawing. Rose thorn, ink and pencil. 33 x 25,4 cm. Zeichnung. Rosenstachel, Tusche und Bleistift. 40.6 x 20.3 cm. Pen, ink and watercolour. 40,6 x 20,3 cm. Tuschfeder und Aquarell. 40.6 x 20.3 cm. Charcoal, pencil and black ink. 40,6 x 20,3 cm. Kohle, Bleistift und schwarze Tusche. 25.4 x 15.2 cm. Pencil drawing of a vagrant with associated notes. 25,4 x 15,2 cm. Bleistiftzeichnung eines Landstreichers mit dazugehörigen Notizen. Drawing of a vagrant with associated notes. 35.6 x 27.9 cm. Pen and ink. Zeichnung eines Landstreichers mit dazugehörigen Notizen. 35,6 x 27,9 cm. Tuschfeder. 40.6 x 30.5 cm. Pencil and ink. 40,6 x 30,5 cm. Bleistift und Tusche. Aesthetic Note. 27.9 x 20.3 cm. Watercolour, pen, ink and bodycolour. Ästhetische Notiz. 27,9 x 20,3 cm. Aquarell, Tuschfeder und Deckfarbe. Aesthetic Notes. 27.9 x 20.3 / 27.9 x 20.3 cm. Mixed media. Ästhetische Notizen. 27,9 x 20,3 / 27,9 x 20,3 cm. Verschiedene Materialien. Aesthetic Note. 40.6 x 27.9 cm. Pen, ink and watercolour. Ästhetische Notiz. 40,6 x 27,9 cm. Tuschfeder und Aquarell. Aesthetic Note. 25.4 x 20.3 cm. Watercolour, pen and ink, heightened with white. Ästhetische Notiz. 25,4 x 20,3 cm. Aquarell und Tuschfeder, weiß gehöht. Aesthetic Note. 27.9 x 22.9 cm. Mixed media. Ästhetische Notiz. 27,9 x 22,9 cm. Verschiedene Materialien. Aesthetic Notes. 24 x 16.5 / 24 x 16.5 cm. Pen, ink and watercolour. Ästhetische Notizen. 24 x 16,5 / 24 x 16,5 cm. Tuschfeder und Aquarell. Aesthetic Note. 20.3 x 29.2 cm. Watercolour, Pen and ink. Ästhetische Notiz. 20,3 x 29,2 cm. Aquarell und Tuschfeder. Aesthetic Note. 29.2 x 38 cm. Pen, ink and watercolour. Ästhetische Notiz. 29,2 x 38 cm. Tuschfeder und Aquarell. Aesthetic Note. 27.9 x 20.3 cm. Pen and ink. Ästhetische Notiz. 27,9 x 20,3 cm. Tuschfeder. Aesthetic Note. 27.9 x 20.3 cm. Pen, ink and watercolour. Ästhetische Notiz. 27,9 x 20,3 cm. Tuschfeder und Aquarell. Aesthetic Note. 26.7 x 24 cm. Pen, ink and watercolour heightened with white. Ästhetische Notiz. 26,7 x 24 cm. Tuschfeder und Aquarell, weiß gehöht. Aesthetic Note. 33 x 17.8 cm. Cryla on paper. Ästhetische Notiz. 33 x 17,8 cm. Cryla [Acrylfarbe] auf Papier. Aesthetic Notes. 8.9 x 15.2 / 8.9 x 15.2 cm. Cryla on paper. Ästhetische Notizen. 8,9 x 15,2 / 8,9 x 15,2 cm. Cryla [Acrylfarbe] auf Papier. Aesthetic Note. 20.3 x 29.2 cm. Watercolour heightened with white, pen and ink. Ästhetische Notiz. 20,3 x 29,2 cm. Aquarell, weiß gehöht, und Tuschfeder. Aesthetic Note. 40.6 x 27.9 cm. Watercolour and bodycolour. Ästhetische Notiz. 40,6 x 27,9 cm. Aquarell und Deckfarbe. Aesthetic Note. 40.6 x 50.8 cm. Watercolour and bodycolour on paper. Ästhetische Notiz. 40,6 x 50,8 cm. Aquarell und Deckfarbe auf Papier. Aesthetic Note. 38 x 53.3 cm. Mixed media. Ästhetische Notiz. 38 x 53,3 cm. Verschiedene Materialien. Aesthetic Note. 33 x 58.4 cm. Mixed media. Ästhetische Notiz. 33 x 58,4 cm. Verschiedene Materialien. Aesthetic Note. 40.6 x 40.6 cm. Mixed media. Ästhetische Notiz. 40,6 x 40,6 cm. Verschiedene Materialien. Aesthetic Note. 29.2 x 20.3 cm. Mixed media. Ästhetische Notiz. 29,2 x 20,3 cm. Verschiedene Materialien. Aesthetic Note. 40.6 x 30.5 cm. Watercolour, pen and ink, heightened with white. Ästhetische Notiz. 40,6 x 30,5 cm. Aquarell und Tuschfeder, weiß gehöht. 33 x 30.5 cm. Watercolour heightened with white. 33 x 30,5 cm. Aquarell, weiß gehöht. Aesthetic Notes. 33 x 16.5 / 35.6 x 35.6 cm. Mixed media. Ästhetische Notizen. 33 x 16,5 / 35,6 x 35,6 cm. Verschiedene Materialien. Aesthetic Note. 50.8 x 41.9 cm. Pen, ink and watercolour. Ästhetische Notiz. 50,8 x 41,9 cm. Tuschfeder und Aquarell.